Olive Garden Parmesan Roasted Asparagus was a recipe that was requested by so many of you, that I had to make a special trip out to one of my best-loved restaurants, the Olive Garden . They have a new menu item as part of their lighter fare, and let me tell you; it is delicious. In the spring, you can get some of the best and freshest Asparagus. When I lived in Michigan, it is one of my favorite things was to drive home, (I lived out in the country) and to stop at the stalls alongside the road. A bunch of fresh asparaguses would set you back about a dollar. While I lived there, my love of asparagus had me planting about 80 plants. I love asparagus. 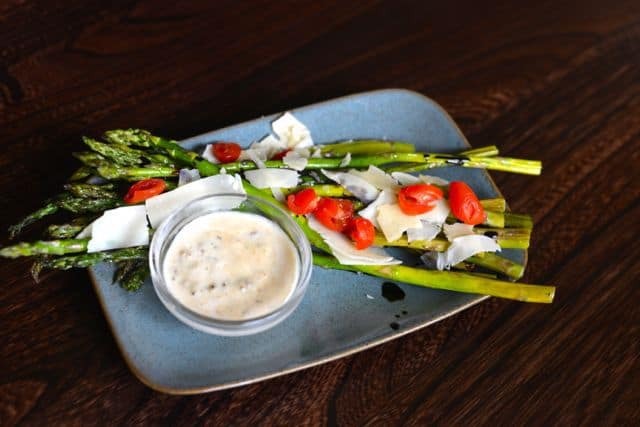 This copycat, Olive Garden recipe, has asparagus simply grilled with a little dressing of oil and a sprinkling of salt. I had a squeeze of lemon juice just to bring out the flavor of the asparagus. I then reduce a small amount of balsamic vinegar, and make a Parmesan cheese sauce to pair with this. Does it get any better? I don’t think so when it comes to asparagus. When buying fresh asparagus, I suggest that you look for smaller stalks they tend to be less woody. If your market keeps them on ice even better. I always like to turn over my asparagus and make sure it looks very well hydrated. If the ends look a little dry, you can always snip off the ends and soak the stalks in a bit of water so they will rehydrate. I hope you enjoy this recipe as much as I do. For those of you who are paleo, and gluten-free, I have had given you a recipe you can enjoy as well. If you don’t have access to a grill, you can cook your asparagus in the oven under your broiler. Prepare balsamic vinegar reduction by adding 1 cup of balsamic vinegar to a small pot. Heat on high until the mixture boils, then turn down to simmer for 20 minutes. The reduction should yield 1/2 cup of vinegar. Store in an airtight container. Prepare asparagus by cutting off about 1 inch of the bottom end of the asparagus, lay asparagus on a sheet pan drizzle with oil and sprinkle with salt. Roast on medium heat on a grill for about 10 minutes turning the asparagus over. Cooking time with vary with the thickness of the asparagus. Remove asparagus from grill when done. If desired squeeze 1/2 of a lemon over the asparagus. I do not think the Olive Garden does this, but I think it really helps to bring out the flavor of the asparagus. Prepare Parmesan sauce by adding heavy cream and 2 tablespoons of grated Parmesan cheese in a small pot or skillet. Simmer on low for about 10 - 12 minutes. The cream should reduce by 20% in volume. To prepare plate some of the cooked asparaguses on a plate, drizzle balsamic vinegar on top. Garnish with 1 tablespoon Parmesan cheese, and then serve with the sauce. Garnish with fresh chopped tomatoes if desired. If you can only find large asparagus, you can peel the stalk with a vegetable peeler, this will peel away the tough part of the asparagus! Serving size? Recipe says serves one. This looks nummy. Fortunately tomorrow is Market Day :D. Looks like I know what part of tomorrow’s supper will be, lol. I am happy to hear you enjoyed this recipe. Has anyone tried making this? I wanna know if it taste like the Olive Garden’s Parmesan asparagus & what tweaks people have made to make it just as tasty? I tried to make this the best that I could to taste just like it did in the restaurant. I hope you give the recipe a try. The parmesan sauce in the picture appears to have something added other than the cheese and cream? Is the pictured sauce of the one in recipe? I got a little heavy handed with the pepper to break up the white sauce for the photo. Sure, I got a little heavy handed with the pepper trying to make the sauce less white. I was unhappy with my photos with all of that white sauce there. Hi Stephanie, I’m featuring this recipe but I think you might have one too many Roasteds in the recipe title? Just wondering, feel free to delete this after you read it. Thanks 😉 I’ll take care of this. That’s what I get for writing posts as soon as I roll out of bed in the morning! Is there a anything I can substitute for the Heavy Cream? Milk or heavy cream would work well. How about subbing with non fat evaporated milk? That could work too, that isn’t something I buy very often so I never think about it.